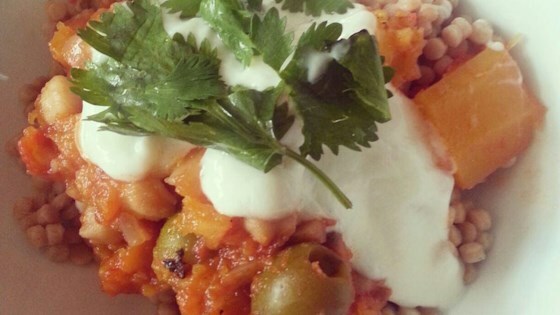 "A great vegetarian meal that's really easy to make. Serve over steamed couscous." Heat olive oil in a large covered saucepan or Dutch oven over medium heat, until oil is hot but not smoking. Drop in the onion, garlic, cumin, cinnamon stick, and salt and pepper. Cook and stir for 5 minutes, until onion is tender and translucent. Stir in the butternut squash and potato cubes, broth, garbanzo beans, and tomatoes, and bring the mixture to a boil. Reduce heat, cover the pot, and simmer about 20 minutes, stirring occasionally, until the squash and potatoes are tender. Remove the stew from heat, and stir in the olives and lemon zest. In a large saucepan, bring 1 3/4 cup water to a boil. Stir in couscous. Cover and remove from the heat; let stand for 5 minutes. Fluff with a fork; cool. Serve stew over cooked couscous. Garnish each serving with a dollop of yogurt and a sprinkle of cilantro leaves. The house smells delicious! I didnt have canned tomatoes, so i used two cans of tomato paste. Turns out the stew was rich and thick!!!! Loved it on a bed of couscous or quinoa. Very nice easy and inexpensive, and healthful, vegetarian dish. Thanks for this recipe.